The project was initiated in connection with the Metro4 project, due to the need for environmental management around the ventilation facility at Bocskai út. The concept was to create a treasure island-type (Kincses sziget means Treasure Island) atmosphere in the urban jungle. This is achieved by winding beaches, the palm trees, and a lush jungle atmosphere. 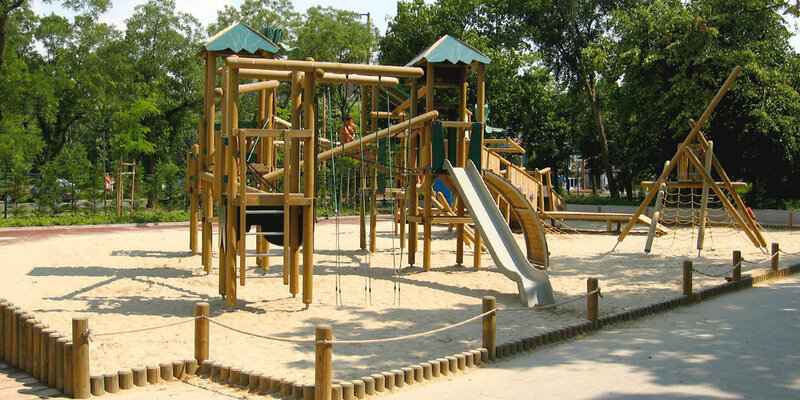 The sandy play surface is marked by a loose rope fence with wooden posts. 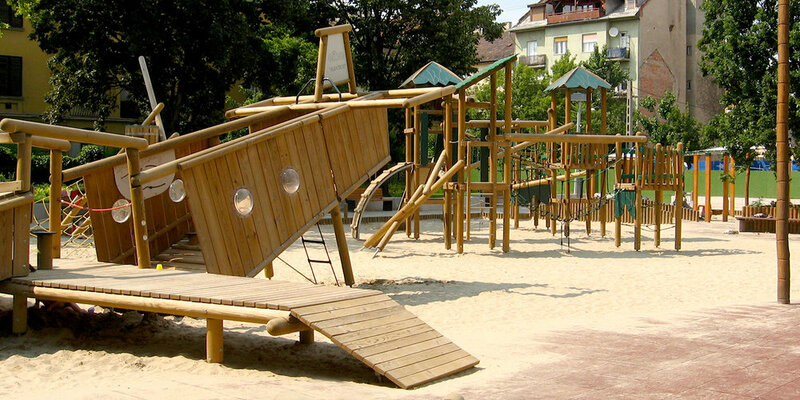 The playground offers activities for age groups 1-3 and 4-12. The adventure begins on a wooden crashed plane on the ‘shore’ with camouflage imitating rope-nets to climb, and continues in the “water” with a climbing labyrinth, slides and various other rope-climbing facilities to trigger children’s imagination. The labyrinth enables kids to explore climbing, balancing, suspension, developing physical dexterity, coordination and strength. Children have endless possibilities to test themselves in a safe environment with climbing ramps, metal climbing nets or a spiral stainless steel tube. The sand represents the sea, while the red rubber cover represents the beach. The right side of the bridge has the equipment suitable for ages 1-3, including sandboxes in the shape of starfish, dolphin swings, and a baby slide in the shape of a ship. The beach atmosphere wouldn’t be complete without palm trees we scattered around the site. Constructor: Swietelsky Építő Kft., Park-Line Kertészeti Kft.